I have started to record game videos with the popular recording software Fraps. Problem with Fraps is, that it splits movies into 4 Gigabyte chunks which is not really helpful if you want to upload one video to your website or YouTube, and not parts of the video. VirtualDub is a software with the ability to merge avi files, the recording format of Fraps, and the ability to compress the video to reduce the file size; Ideal for my purposes. You can also use this tutorial for other purposes, for instance to merge episodes of a TV series, or multiple videos that you have shot with your camcorder, digital camera or smartphone. Everything is possible as long as the input format of the videos is avi. Download the latest version of VirtualDub from the official website. Unpack the portable software to your hard drive after download, and run the VirtualDub.exe afterwards. You load the first movie with a click on File > Open Video File. Click on File again and select Append Avi Segment for each additional part that you have as a file on your hard drive. You can only load one movie at a time, which makes the process somewhat unhandy if you have many different parts. Switch to the Video menu and make sure Full Processing Mode is selected there. 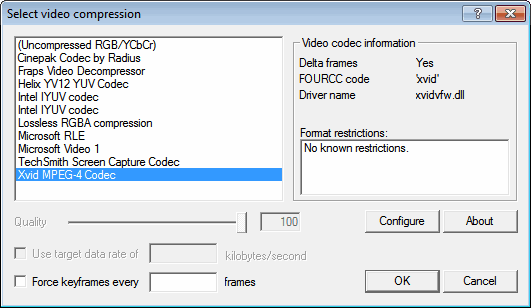 Click on Compression under Video afterwards, and select one of the available video codecs. Please note that you need suitable codecs installed on your system for a solid result that offers a good image quality and suitable file size. You can furthermore add filters to the process, for instance if you would like to resize the video, change the brightness and contrast or add a logo to one of the corners. You can preview the changes by pressing enter or by selecting File > Preview Filtered. Once you have made your selection select File > Save as Avi and pick a directory on the local hard drive to save the video to. VirtualDub will display a status window where you can get information about the current processing status, as well as an estimation of the file size of the new video file. You can jack up the process priority if your computer is idle otherwise. And that's it. Just wait for the process to finish. It is recommended to play the video once on your hard drive to make sure that the merging was successful and without errors like out of sync audio. ” that it splits movies into 4 Gigabyte chunks” ? You want to merge/upload 4GB + video files ? what are these 1080p HD ? Blu-ray files ? Was just thinking the same…. Well for me it seems as if Fraps uses no compression, or very light compression at best. I run a 1920×1200 screen, and ask Fraps to half that automatically. 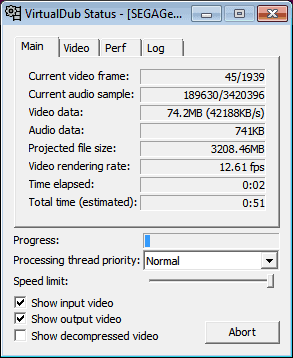 I get about 6 minutes worth of video per 4 Gigabyte chunk. I merge and compress the movies before I upload them. I know this is late, but there is a setting in Fraps that will split the videos every 4gb, and then create a new file, and it will keep doing this until you finish recording. very informative post, thanks for shaing it..
for most simple video file editing tasks like merging, splitting, converting, watermarking, etc ffmpeg is the best. ffmeg is a nightmare to use in this case. For Fraps VDub is THEE only application to use to merge and compress. I can do 56 GB worth of files in 40 minutes. There is a much simpler program called Machete Lite [Freeware] that will let you do this in less steps. You also don’t have to re-encode. I use Fraps to record my gaming sessions and some games are like 30 minutes long resulting in some big files. Great I take a look at it. Machete Lite DOES NOT compress the files in any way, therefore leaving a person with ONE HUGE file. Why would I want to merge multiple 4GB Fraps files into one HUGE file? I have a current game of B2 I want to upload to youtube. If I used Machete Lite I would merge 14-4GB files which would give me a 56GB video. Worthless. If I use VirtualDub and my pc has the Xvid codec installed, I can get a FULL video of 1 to 2GBs with those 14-4 GB files with almost NO quality loss. For what reason, in what world wouldn’t I want a 1.5GB video that has the same quality as a 56 GB video? please ready my comment i forgot to reply to you when i posted my question. I installed divx plus convertor which includes the codec and got the 64 bit virtualdub (yes i have win7 64 bit and processor capable of 64 bit) but virtualdub don’t ever give me the option of using divx..any ideas?